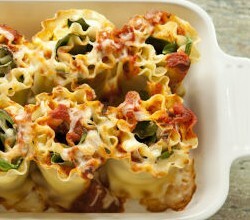 A fun way to switch up your lasagna recipe! Lasagna Roll-ups as served at Thom & Nancy’s party! Pour the sauce into a casserole dish. Mix the ricotta, shredded mozzarella, garlic, basil, a dash of salt, pepper and a little drizzle of olive oil. Spread the cheese mixture onto each noodle, gently. Top with a few of the thinly sliced zucchini. Roll and place in casserole dish. Once you’ve rolled all of the noodles. Cover with sauce and top with parmesan cheese.